Does gender make a difference in how migraines affect a particular individual? According to the Migraine Research Foundation, women are three times more likely to get migraines than men. Furthermore, Mayo Clinic affirms that 17% women experience migraines as opposed to 6% of men. 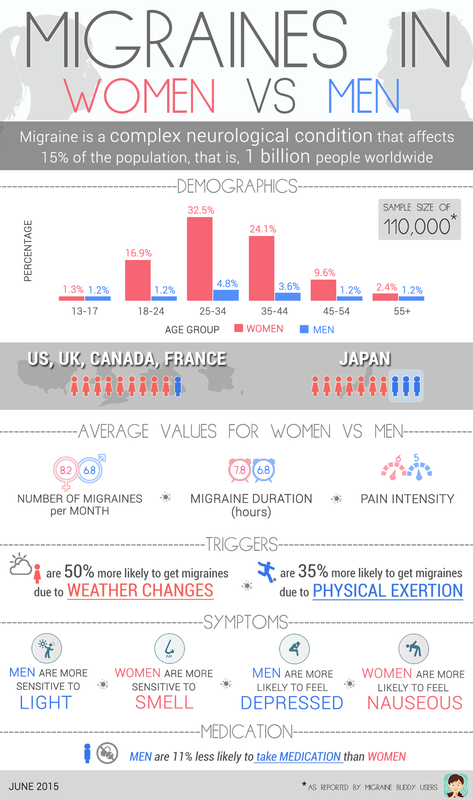 The general consensus regarding migraines seems to align with migraines being a predominantly female illness. Women are also more vocal about living with migraines. Most of the leading migraine and chronic pain advocates are women with only a handful of male counterparts. Even in online migraine forums and support groups, women largely lead discussions and posts by male members are rare. Are men not as affected by migraines as women? To understand this assertion, data scientists at Migraine Buddy, a popular app for tracking migraines, analyzed data from over 110,000 migraine sufferers who use the app. The study explored how various factors including migraine triggers, symptoms and pain intensity affect both genders. The results affirm that migraines are more adversely affecting women but that doesn’t make them a walk in the park for men either. The data was retrieved from a geographically diverse user pool from USA, UK, Japan, Germany, Argentina and France amongst others. About 73% of the users were female with 27% being male – both genders were largely in the 18-35 year age bracket. It was interesting to note that most users from Spain and France were females in their early twenties. Japan’s user base, with 32% male users, comprised of more men than any other country. This was in sharp contrast to male users from the USA, who surprisingly were only 4% male. The USA and UK had the highest percentage of middle-aged women using the app. Migraine Buddy statistics indicate that women experience migraines that are longer and more painful. The app’s data scientists determined that female users suffered an average of seven migraines a month whereas male users seemed to average at six migraines a month. The average pain intensity of migraines on a scale of 1-10, was 6 for women and 5 for men. The traditional belief that women have a lower pain threshold coupled with the tendency for men to appear macho when faced with pain could be a potential explanation for this occurrence. The Migraine Trust, a leading migraine charity in the UK, reports that men are more likely to “struggle on” in an illness and may view it as a sign of weakness. However, a study conducted at the Stanford Hospital and Clinics affirmed that there was a clear divide between the pain level reported by women and men- women reported higher pain levels than men across varying diseases. A viable explanation for this divide could be hormones. Estrogen, possibly the main culprit, can elevate pain levels during a specific part of a woman’s menstrual cycle causing greater discomfort. In fact, the Migraine Research Foundation asserts that migraine is more frequent in younger boys than girls, until they hit puberty and estrogen imbalances take place. Having said that, it’s important to remember that migraines are usually exceedingly more painful than regular headaches and a 5/10 pain level is in itself excruciating to bear. Whereas the cause of migraines for both men and women can often be cumulative, the leading cause of migraines for both men and women using Migraine Buddy is stress. The causes of stress in an individual vary greatly- it can be brought about by work life, relationships, certain lifestyle choices and even childhood trauma. A recent study conducted by a research team including Dr Dawn C Buse, found that children who were abused or neglected were at a higher risk of developing migraines as adults. This was true for both men and women. However, men are 35% more likely to report physical exertion as a migraine trigger. Exercise can often be a double-edged sword for migraine sufferers- some claim it is a trigger whereas others find it to be a helpful method to relieve migraine pain. However, migraines that occur solely during physical exercise can be indicative other neurological issues such as irregular blood flow to the brain. Women on the other hand are 50% more likely to experience weather as a migraine trigger. Changes in weather can often cause imbalances in serotonin, a chemical found in the brain. Migraine Buddy’s data scientists also found that men are 35% more likely to report alcohol as a trigger. This may be in part due to differences in lifestyles of men and women and also the fact that alcohol is chock-full of tyramines- a very common migraine trigger. Drinking alcohol can also cause dehydration which often prompts migraines to occur. Interestingly, Migraine Buddy statistics state that women are more sensitive to smells during a migraine and report nausea as a symptom more often. Not much research has been conducted on the link between migraine and smells but it has been established that certain odors can prompt a migraine. The smells most likely to trigger a migraine are perfumes and colognes, specific food smells and cigarette smoke. As is the case for most migraine triggers, this is also extremely subjective and varies from person to person. Although certain smells can often spur it, nausea is a very commonly reported symptom for migraine with almost 80% of people diagnosed with migraine experiencing it. Alternatively, Migraine Buddy statistics maintain that men are more sensitive to light during a migraine. Migraine Action, another UK based charity, states that migraines can be set off by flickering lights and that research has shown that photophobia (sensitivity to light) could most likely be linked to the optical nerve. Migraine Buddy’s data scientists also discovered that male users were more likely to report depression as a symptom for their migraine. It has long been established that there is a strong link between migraine and depression. Migraine sufferers, especially chronic ones, often suffer from depression and tend to have a lower quality of life due to their condition. This is often due to lack of productivity, difficulties in holding down a job or maintaining an active family and social life due to migraines. Coping with migraines may be harder for men as, in most households, they tend to assume the role of the provider and the effects of suffering from such a disabling condition can lead them to feel helpless and depressed. Men are also 11% more likely to not take medication to treat their migraines. Many male Migraine Buddy users reported that they did not consult a doctor to treat their condition. Since a large proportion of migraine treatment medication is prescription based, not consulting a doctor may be the cause of lower medication intake by men. However, according to The Migraine Trust, not all migraine sufferers take medication to treat migraines. Often the remedy for milder migraines can simply be resting more, getting more sleep and actively modifying lifestyle choices. Michelle Tracy, a chronic migraine sufferer, an active pain advocate and migraine blogger, has observed that each individual can have a unique treatment method that is helpful. “You don’t ever need to feel like a failure just because a treatment that works for many doesn’t work for you. Conversely, just because a treatment does help you doesn’t mean that your migraines are any less legitimate. Different things work for different people,” says Tracy. Migraine Buddy users have reported taking a mix of over-the-counter (OTC) and prescription drugs for migraine relief. However, more chronic migraine patients (those with 15 or more migraine events a month) whether male or female, are more likely to take preventative medication on a daily basis to curb migraine occurrences. Women were also 50% more likely to take three or more medications during a migraine. Interestingly none of the medication prescribed to migraine patients has been specifically developed to treat the debilitating effect of migraines. Nevertheless, new studies have shown promise for monoclonal antibodies that effectually target calcitonin gene-related peptide (CGRP), one of the main instigators of migraines. This research could potentially be a breakthrough for migraine sufferers, both men and women alike. “You don’t ever need to feel like a failure just because a treatment that works for many doesn’t work for you. However, getting a proper diagnosis for migraines is essential. Diagnosis is the cornerstone of understanding what treatment plan will be applicable to bring migraines under control. Tracking migraine events can also be helpful for both genders to track determine what could be causing their migraines and eliminate those factors from their life. Neurologists and general practitioners alike maintain that keeping a migraine diary can help immensely in evaluating the cause of migraines. Migraines are often misconstrued to be a slightly worse version of the headaches that most people occasionally experience. In reality, migraine is a complex neurological condition which affects nearly 1 billion people worldwide. No wonder the World Health Organization has deemed migraine as one of the top twenty most disabling illnesses in the world. Although gender differences are helpful in understanding how men and women may approach migraines, it is important to introspect on individual circumstances when dealing with migraines. Often slight modifications in lifestyle choices, like drinking less alcohol, meditating more often or eating healthier can help reduce migraine occurrences. Finding support for dealing with migraines can also help in alleviating their impact on a migraine sufferer’s life, especially if depression and mood swings are a prevalent symptom. The online migraine community can be a vibrant and therapeutic space to find the support and help for dealing with migraines. Several non-profit migraine associations and charities, bloggers and social media groups are playing a key role in providing platforms for migraine sufferers to connect. Social media groups such as Chronic Migraine Awareness and Migraine Support Group have over ten thousand members actively discussing treatment options, doctor visits, living with migraines and simply sharing their feelings. The best part is that they are open to both men and women migraine sufferers as well as caregivers of those who deal with this condition.